The lure of sun on my face in February made me leave the office early this afternoon and get in a couple of hours bit bashing in Phillips Park. 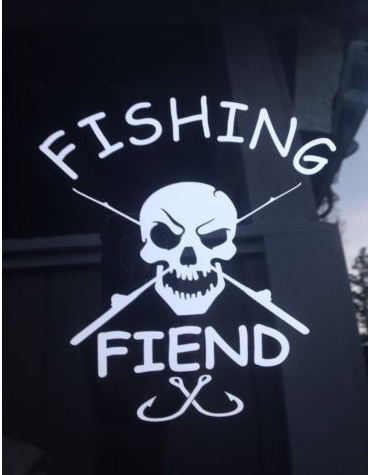 I am not at my best fishing then pole but wanted to catch some small fish to use as deadbaits this weekend. I bumped off more fish than i caught, but still ended up with a good few roach to about 4oz. I also caught lots of greedy small perch and a suprise veil tail brown goldfish of about 3/4 lb. I thought i was going to get some gudgeon but i think they must be on holiday as i havent caught one yet in two visits to this lake so far this year, when normally they are like a plague. I woke up one morning just before Christmas and discovered a visitor at end of the garden. As i live less than 3 miles from the city centre of Manchester i was stunned at the sight of this deer. My sister still doesnt believe it and thinks i have set this photo up with a stuffed animal! Big smiles after a great afternoons fishing from Dave and Matt. We spent the afternoon on a stretch of the river we have never tried before near the centre of Manchester. It was a HUGE shock to us to see other people fishing on the Irwell – at one point there were six fishermen in 100yds of riverbank! Just as we arrived one of the guys already fishing was in the process of catching a typical Irwell pike (about 4lbs). Sadly this was the only fish of the day as nobody else had even a touch after that. This was a pity as it was a lovely afternoon for February. This resulted in no livebaits and the neccessary purchase of deadbaits from the tackle shop, which were c**p and turned to mush as soon as they defrosted. I have successfully paternostered live and dead baits on still waters but never on rivers. The force of the flowing water was too much for the floats i had in my tackle box and it made bite indication virtually impossible as the float was submerged by the force of the flowing water. After an hour or so we gave up and put on a lure. I had some pinkies with me and tried trotting these down an inside line for an hour or so, but was only fishing half heartedly as i was more concerned with assisting Matt. A strong flow and light bait such as pinkies arent the best combination, and the swim i fished could be much better attacked with a different approach (maybe i will try mashed bread and flake on the hook next time). Neither of us had even a touch, but had great fun chatting with Dave, who is one of Matts coaches from the Segdley Park under 12’s rugby team. Dave is a really keen angler, and like many other Mancunian fishermen is amazed that people are now fishing the Irwell. 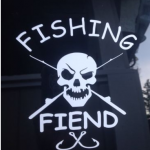 Dave is really good fun and has lots of great fishing stories to tell which pass the time when the fish arent biting. As you can see from the photo we stayed until the light had gone but were still laughing and joking at the end of a good afternoon. You dont need to catch to have a good time, we tried out a new swim which offers great pike fishing and also looks as though it has great potential to fish the stick. I cant wait to give it another try and might do so one afternoon later this week. I also had the pleasure of meeting Nick and Tom who were also fishing the Apelhi Weir. Nick has an excellent blog http://www.anglingforsomething.blogspot.com/ Nick and his friend Tom are very knowledgeable and have an obvious passion for angling. It was great to discuss different swims, baits, venues etc whilst the fishing was slow and meeting them certainly added to the afternoons enjoyment. Its great to discuss how the river is slowly evolving from an open industrial sewer, to a river system that now supports Salmon, Otters and Kingfishers with people who care and take the time to notice the changes that are taking place. Most Mancunians still regard the River Irwell a dead, polluted throwback to our industrial heritage. Unfortunatley there has been very little local publicity as to the huge steps taken by the EA and United Utilities to improve the water quality in the Mersey Basin and the improved wildlife habitats that this has helped provide. The vast majority of locals have no idea the Salmon now run up the Mersey every year and are spawning in tributatries such as the Bollin and Goyt. It was good to discuss the potential of Salmon fishing in Manchester with fellow fishermen on the banks of the River Irwell ! A fish for Matthew was the only thing that was missing from a great afternoons fishing. Started at lunchtime and fished til dusk at 5pm. Caught nothing, no takes, no follows nothing. Freezing cold, blue hands, lost 3 spinners and the will to live. Maybe i should know better by now than to fish the river the day after half an inch of snow has melted. 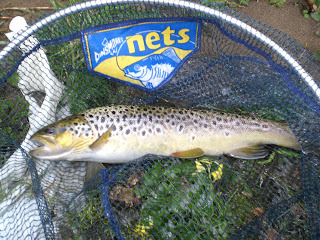 Next weekend i am going to target the fish at a couple of the big weirs on the river in Salford, conditions permitting. I woke early and saw the sun shining, i just had to go fishing for an hour before work. So i decided to try out a new stretch of the river where i had previously walked the banks but never fished. This stretch consists of lots of shallow broken riffles but also 3 deep pools. As i wished to keep things simple i decided to get the spinning rod out again and loaded up with a bronze mepps style spinner. I had no takes or follows in the first two swims, but the third swim was the conjunction point of the rivers roch and irwell. The swim is a lovely long deep glide and it had pike written all over it. I wasn’t to be disappointed as on my third or fourth cast i had a take from a smallish jack pike as i was finishing my retrieval. However the hooks hadn’t set and when the fish opened its mouth out popped the spinner. After only a small amount of cursing and dark muttering i re-cast and two or three casts later had a take from a much larger fish, again nearly at the end of my retrieve in front of my feet. Its thrilling to watch a pike home in on a lure right in front of you. This fish had the clutch on my reel screaming as it turned and tore off into mid-stream. Again though, it shed the lure and i was left disappointed. My initial hour turned had turned into two so now i had to pack up and get into the office. It was great to get the feel of this new area of the river and i am sure i will come back to run some smelly cheese or lobs through the very chubby swims this section contains. As for the Pike, maybe i should strike harder? sharpen the hooks on my lures? purchase a softer actioned rod? If its warm enough this weekend i might sit behind my pole for an hour or two and try for some roach and skimmers on the bridgewater canal or if its too cold for sitting still i am going to make up some Gorgonzola paste and see whats biting down at the cliff. I decided to try the River Irwell for the first time this year as the river levels were slowly returning to normal after the recent heavy rains. The water clarity wasnt great but was no longer dirty brown. As there are so many snags in the river (cars,tyres,motorbikes shopping trolleys etc) i use very cheap spinners when fishing here, and find silver to out perform any other colour. I only fished 3 swims as is was a short session and had this nice little pike after an hours fishing. I have a busy week at work coming up and dont expect to get out this week. However Matt is with his mum next weekend meaning a full weekends fishing for the first time in ages (weather permitting). As ever i saw no other anglers on this stretch of the Irwell and my only companions were the bats wheeling over the river feasting on the evenings hatch. First Fish Of The Year ! As the Irwell was well up and the colour of hot chocolate, we fished a lodge in Prestwich Country Park for a couple of hours. This particular water has a reputation for great Piking and Matt wanted to catch his first Pike. His clueless dad forgot to bring deadbaits, so we set out to catch some small roach. You would have thought that single pinkie on a size 22 would have brought roach after roach but we couldn’t catch anything other than small Perch. I don’t like using them as live / deadbaits as they are not as effective as other fish as bait for Pike. I think you cant beat the oily smell from dead sea baits or the silvery flash of a roach for attracting Pike. Try as we might the roach weren’t interested and as the prospect of Pike fishing lessened so did Matt’s patience. So in two hours fishing(before Matt told me he was bored an wanted to go home) we had numerous bites and a few small perch to show for our afternoons fishing. Even though 2 hours doesn’t seem like much of a fishing session, i think 2 hours on a January afternoon is fair enough and it was just starting to go dark as we packed up ( i bet if i had had another few casts the roach would have turned up in the twilight!). 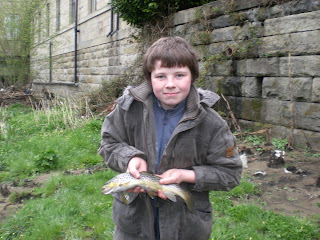 My son Matt with his first trout from the River Irwell April 2007. Caught on worm and bubble float. His ambition for 2008 is to learn to fly fish and catch more trout ! Living in north Manchester i have access to some fantastic fishing. Within an hour and a half driving radius i can fish the rivers and lakes of North Wales, The Peak District, and Lake District. I have the much improved and rarely fished River Irwell within 5 minutes walk of my front door, where last season i only saw one other angler enjoying the fantastic free fishing. I caught roach, chub, perch and brown trout on the Irwell last year 2007 and hope to share with you some of the catches i make there.